Full length tablecloth would be 90" x 156". 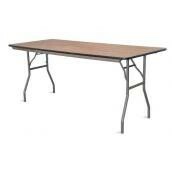 8' x 30" Rectangular Banquet Table Rental. These tables seat 8 to 10 people.